作者: Lee Sang-ki on 10 September , 2018. During the Asian Games, President Joko Widodo announced that the 2032 Olympic Games will be held in Indonesia. I would like to show full support to this. Not only me, but Koreans, other Asians, and friends all around the world will try their bests to Indonesia successfully host the Olympic Games. Speaking from my experience, President Joko Widodo who is visiting Korea from the 9th to 11th to have a conference with President Moon has outstanding leadership. When I met him two times in May 2016 at the Presidential Office in Indonesia and Ajou University in Korea, he was humble and caring than anyone else. As I saw him listening earnestly to other opinions rather than forcefully pushing his claims and agenda, I could see that he is the role model for 21st century leaders. President Joko Widodo approaching students asking for handshakes without any hesitation truly inspired me and stays in my memory. Imagine only 30 years after changing from a dictatorship to democracy, Joko Widodo leads his country with a population of 250 million, 15,000 islands, more than 100 nationalities with dozens of languages to peace and prosperity in just 5 years. Imagine again: for over a century after the first Olympic Games in 1896, the Olympic Games were held in rich cities such as the United States, Britain, France, Germany, Japan, China, and Korea. Was this truly based on the Olympics value of unity? The Olympics have never been held in a Muslim country, that has 15 percent of the world’s population. The Olympic spirit is based on having no disadvantages or discrimination because of race, language, and religion. Now, it is the time for the world to open up to our Muslim brothers by giving a chance to host the Olympics. Peace cannot be achieved without the humility of the people who own much and the understanding of the mind and passion of the people who own less. 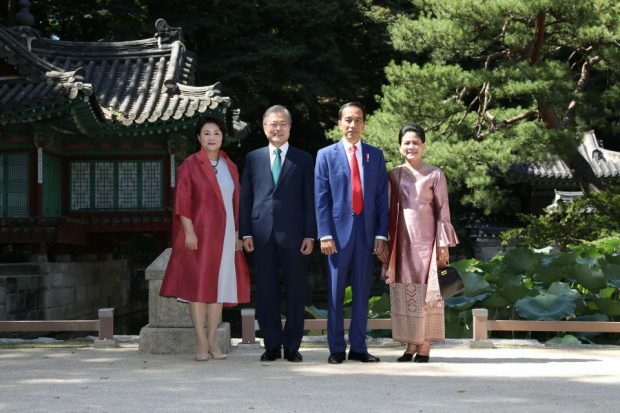 I hope President Joko Widodo actively converses with President Moon about supporting the 2032 Jakarta Olympics. Korea has hosted the Olympics both in the summer and winter. Through the 1988 Seoul Olympics, the United States and USSR came together for the first time in 12 years during the cold war. Also, as you may know, the winter Pyeongchang Olympics broached conversation among North Korea, South Korea, and the US. Koreans are extremely thankful for Indonesia’s contribution to this process. Because of this, I am sure that the 2032 Jakarta Olympics will bring another historic event to humanity. I personally wish to see President Joko Widodo in 2032 appear at the Olympics on his motorcycle at the age of 70. When his motorcycle passes by, I hope he stirs the wind of change that will transform our world full of diseases, war, and division into a world of peace and happiness.